enLIGHTened equipment has been making quilts since 2008 and produces quilts which are warm, light, high-quality and affordable. For the past two summers, autumn and spring I have been sleeping under Revelation quilts - time enough for a living review. This really is a review about three enLIGHTened equipment Revelation quilts: The Revelation 40°F & Revelation X 40°F from 2012 and Revelation 30°F from 2013. 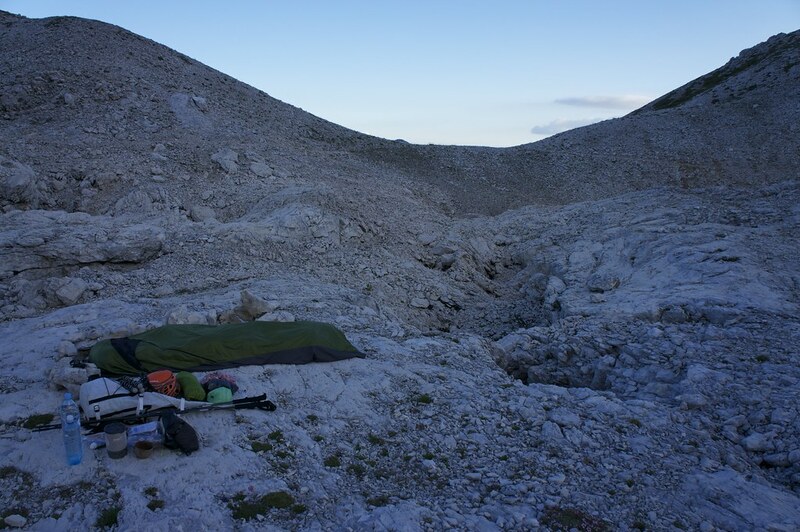 All quilts have spent a minimum of ten nights outside - on the UL Summit in Slovenia, packrafting and backpacking trips and overnighters. 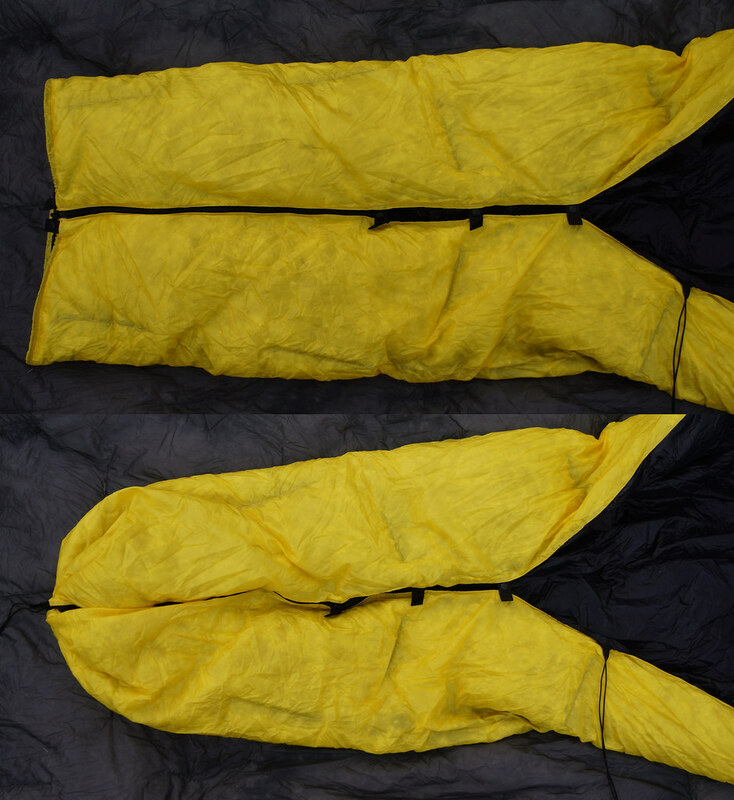 The idea of a quilt is to give you flexibility and to save weight in comparison with a sleeping bag. In a sleeping bag the down underneath you is largely compressed and so can not loft as much. This means the down on which you lay is material and weight which isn’t performing 100% - thus just take it out to save money and weight. After all, you have a good mattress to keep your back warm. The Revelation quilts can be used as a quilt with a closed footbox or as a flat blanket, depending on your needs. Its open baffle construction means you can move the down where you need it (usually to the top), and there are elastic straps which let you connect it to your mattress to eliminate drafts. That’s seven options to play with to create the quilt of your dreams, with prices going from $160 for a summer quilt to $565 for a serious winter quilt. Features in my three quilts are the zippered foot box, an adjustable neck closure, dual-use as a hammock under-quilt and removable straps. All are regular length and width. The open baffle construction of the Revelation Series probaly was a technical innovation (The Epiphany quilt was a major innovation in that it used cuben fibre as the shell and lining for the down!). enLIGHTened equipment is staying at the top of the innovation chain and is quickly adopting new technologies for their products, like the Downtek treated Goose down for their top-of-the-line quilts. You also can see that enLIGHTened equipment is improving their designs every year. My two 2012 quilts e.g. have rubber bands to connect the quilt to the pad, while the 2013 version uses flat buckles through which you can pull flat webbing or elastic straps to connect quilt and pad. 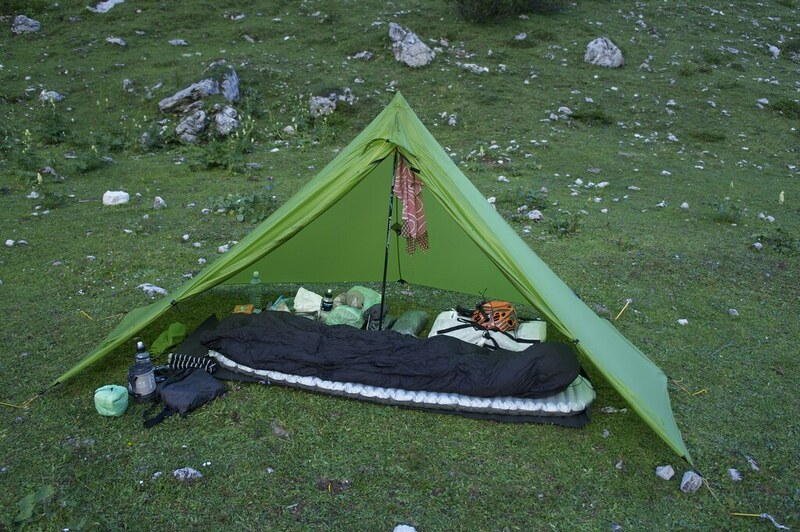 And now in 2014 enLIGHTened equipment is using an updated baffle system, new down, and added several more options and features to their quilts. The quality of the enLIGHTened equipment quilts is great. No lose threads, clean strap ends, the used material is very down-proof, well-running zippers, and the quoted weight is spot on which is a sign of great craftsmanship. While the Revelation X uses Ripstop Nylon seconds and is cheaper than the Revelation and a bit heavier, I could not find any errors in the fabric. If you’re on a budget then the Revelation X (nowadays comparable to the Revelation 750 although the 750 uses high-quality materials - no seconds - and a better baffle system) is a superb choice to try out quilts and see if they’re something for you. All quilts are made in Winona, MN, USA. The weight difference between the Revelation X 40° and Revelation 40° is 100 g and due to the heavier shell and lining of the Revelation X. 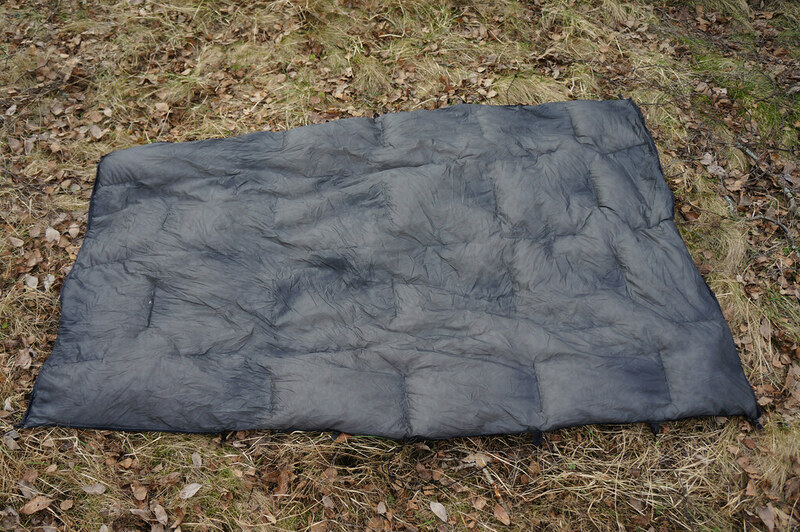 The Revelation 30° on the other hand is a warmer quilt, suitable for spring and autumn use, and the increase in weight is almost exclusively due to to more down being used. Down is a natural material that has a long life if you take well care of it - wash it regularly and a down quilt can last 20 years or longer. 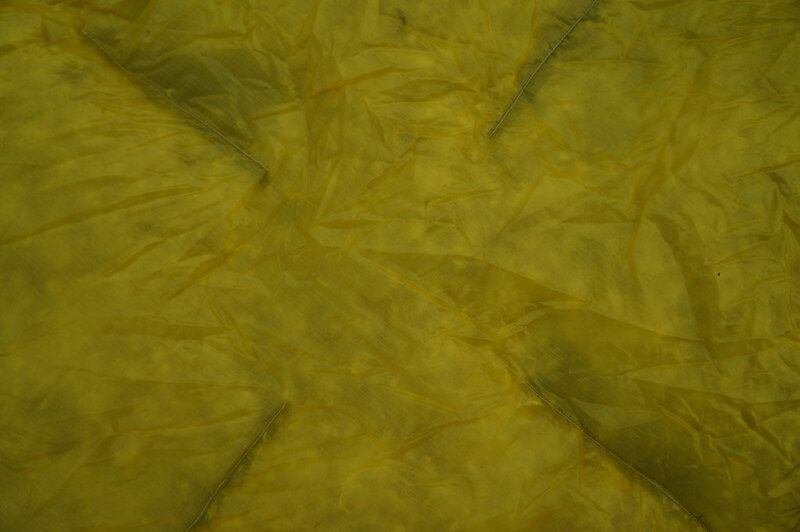 The shell and lining materials, while thin, have proven this far very durable and show no signs of use, even after dozens of nights spend outside and stuffed into compression sacks. There’s no a take-back scheme (yet) where you could return the quilt after many years of use, though you could just drop it in your local garment recycle bin and let them sort things out. All three quilts have seen a lot of nights outside since they arrived - the enLIGHTened equipment quilts are a lot lighter than my Golite Ultra 20° and in my opinion just as warm (GoLite’s quilt is not a 20°F quilt, even if claimed to be!). I love the tiny pack size of the Revelation 40° - it packs very small and is excellent for fast and light trips where not just weight, but also volume matter. With the open baffle structure it’s best if you just check already at home how to use it right. I moved the majority of down to the top in the torso area, and in that configuration the 40°F quilts where plenty warm for summer - often even to warm, but the beauty of a quilt is that you can easily get in and out of it. In the middle of summer where night temps will stay above 10°C I will use the quilt open, and just like a blanket as you’d at home. If it goes under 10°C I zip the footbox closed so my toes stay warm at night. The tapered design helps in saving weight and works well with modern mats which are also tapered. I usually do not connect the quilt to the pad and prefer to just drape it loosely over me, , tucking the sides under me - also because I move a lot in my sleep. It are warm quilts and I had the 40° Revelations down to 0°C without problems (in a bivy on a warm mat), while the Revelation 30°F is fine to around -5°C with a good mattress, a baselayer and in a bivy. If you’re going SUL you can use the quilt as a blanket/ coat at camp and wrap it around you, just snap the head piece around your neck and tighten the strap. You then can fold the footbox up and use the strap from the footbox to wrap it around your waist, which keeps arms, buttocks and back warm with the option of wrapping the quilt further closed in the front for a very cozy “jacket”. Nowadays enLIGHTened equipment quilts can get a head and foot weather protection, which is a DWR treated shell fabric which minimizes the possibility of the down getting wet from your breath at night or condensation that’s on the inside wall of your shelter, against which the footbox might rub. My quilts don’t have that extra, though I think it’s a smart addition, especially if you do not use a bivy to protect the quilt. I sometimes had a bit of moisture at the head end in the mornings but hanging the quilt in the sun to dry for a bit had it dry in no time (that’s why you always should choose one side black!). 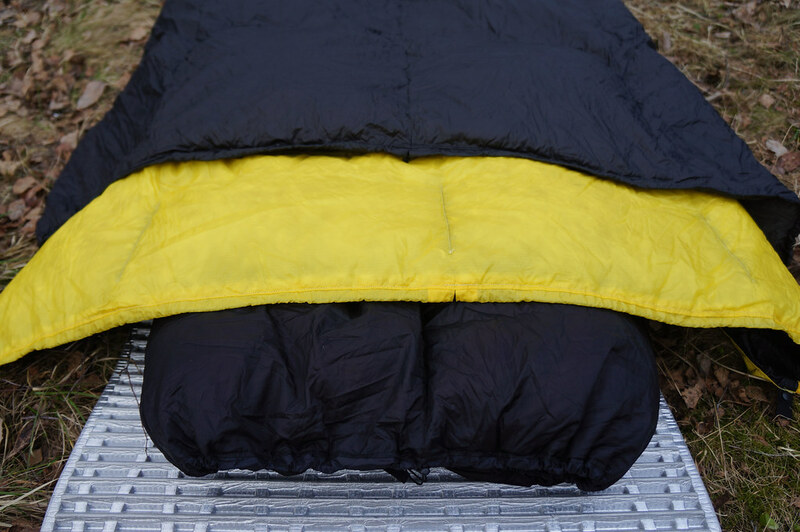 My Revelation quilts both have a 10D fabric on the inside and outside - the lightest option. If you hold the quilts into the sun you can see the down through it, and while a very light material it has shown it can take weeks on end of sleeping under, stuffing into a compression bag and being hanged from trees and fences to dry without getting damaged. It’s a good, lightweight material for summer and autumn bags, and likely will be just as good for a winter bag. The quilts pack very small and loft quickly at camp - shake it a few times, then move the down where you want it and Voilá! you can tuck in. Packing is just as fast - just stuff it in the bag and you’re done. If we stay in the same weight class, the amount of competing products is limited: There’s the ZPacks quilt, Katabatic Gear Chisos, Jacks ‘R’ Better Sierra Stealth, Nunatak Ark Edge and Cumulus 250. If we also look at light sleeping bags, then there’s the Yeti Passion One, Lightwave Firelight 150, Therm-A-Rest Navis and Alpine 35 Down Blanket and several more. Jacob likes the Revelation, David finds the Rev X great and Max gives it four stars. I have been very satisfied with the Revelation quilts from enLIGHTened equipment. They’re very well made, light, functional and pack small for the trail. They loft quickly and I can adjust the down to my needs - evenly spread on warm nights or on top if it is a bit colder. They’re very affordable for such a high-quality product, and given that you can chose from seven options it’s possible for you to design the quilt which suits your needs perfectly. While there are a couple other quilt makers the enLIGHTened equipment Revelation quilts have probably the best quality-to-price ratio of all, and hence are ideal for those that want to give quilts a try or need a 2nd quilt as you’re unlikely to get such a good quilt for such a good price. More photos. Interview with Tim Marshall, owner of enLIGHTened equipment.